Today's thrifty food tip is also a recipe, just cause I can. 😎 If you want to go directly to the recipe, without reading the article, click here, and please rate and review! Pesto is, oddly, at once underrated and overpriced. Dishes made with the warm, nutty, aromatic blend, as well as the ready-made stuff in a jar are nearly always outrageously priced. Perhaps that's what leads folks to think it is expensive or difficult to make, and why so few people make regular use of it in their own kitchens and cooking. The truth is that it takes a few minutes to make in a blender or food processor, and, even using the "finest" ingredients, the stuff is literally pennies a serving. 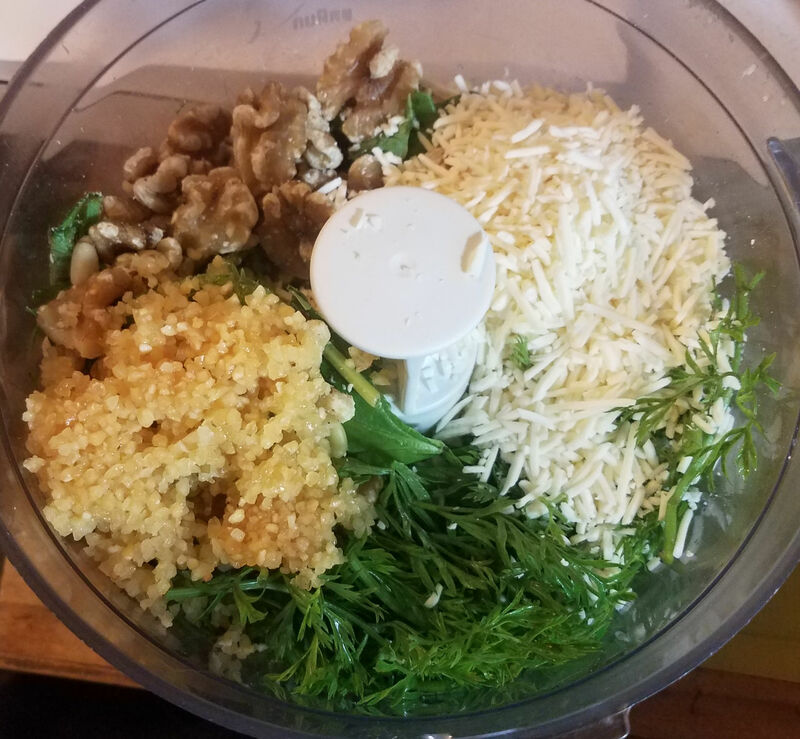 It's basil, pine nuts, garlic, olive oil, parmesan, and a little salt and pepper. That's it. So, already, it's super economical to make it at home, especially if you or someone you know grows their own basil. Many folk cut the basil with spinach to save money and/or tone down the flavour a bit. 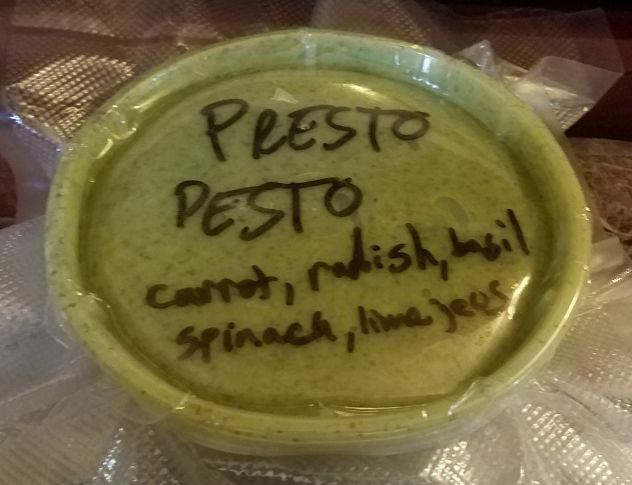 The thing is though, you don't even need those specific ingredients to make delicious pesto! You can literally make it with just about ANY greens and nuts/seeds you have on hand, as long as they're edible. The greens in the batch I just made last week was primarily radish and carrot greens and fresh spinach, with a little bit of chives and Thai basil I snipped from my garden for good measure. My rosemary isn't robust enough for harvesting any just yet, though I'm sure by next fall, I'll have plenty! 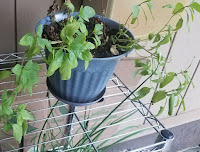 My Thai basil, on the other hand, is going to town! 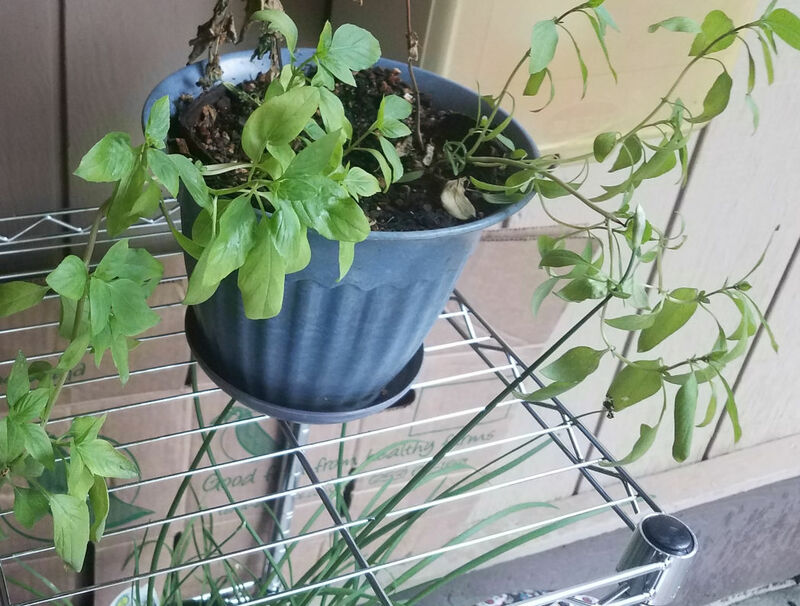 I've got some sweet, Italian basil just sprouted too. It'll be ready to harvest by next season, I'm sure. 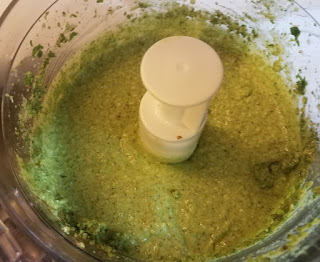 Anyway, since you can use almost all ingredients that would often end up in the compost bin or landfill, this versatile paste of the gods is between dirt cheap and almost free. YAY! 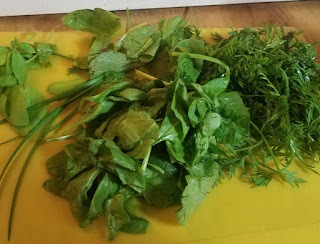 So, as mentioned, the greens in this batch are carrot and radish tops, spinach, and just a bit of chives and Thai basil. 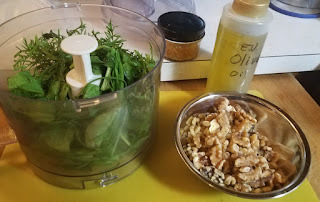 For the nuts, I used mostly walnuts, with a small amount of pine nuts thrown in for good measure. No seeds this time, though I'm definitely planning on making a batch (or two!) using roasted pumpkin/other fall squash seeds once I've got enough seeds saved up for that. I also added a splash of lime juice in this batch, just cause it sounded good, and the results were, indeed, good! I'll be doing that again for sure. 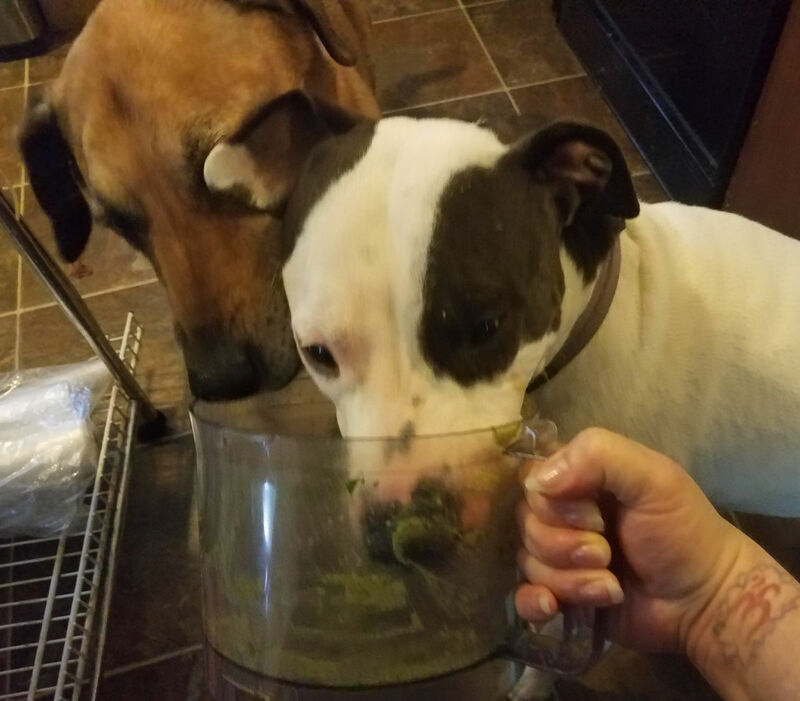 My clean up crew helpers agree that it tastes great! 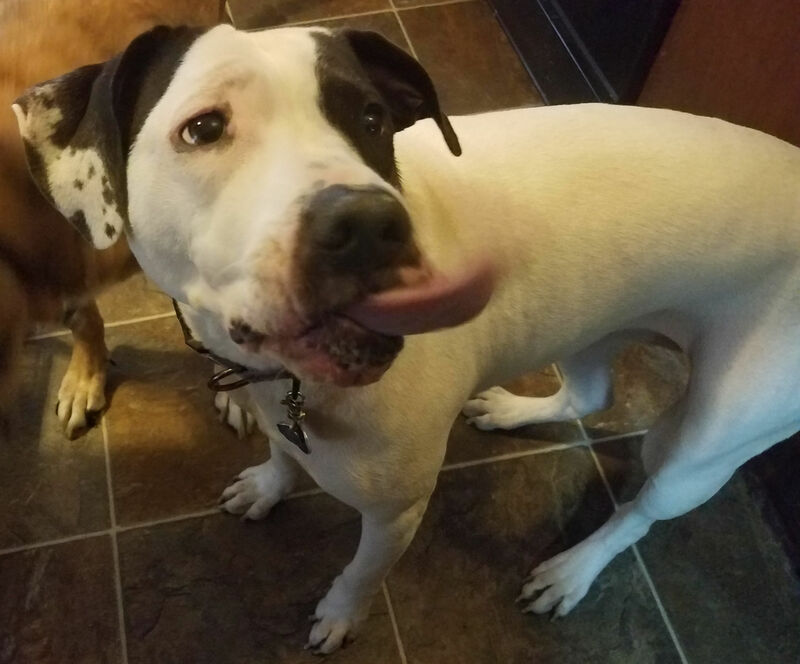 They each give it two paws up. I almost never have to scrape or soak anything before it goes into the dishwasher, with such an enthusiastic set of trusty assistants. Alright; Enough of my rambling. Lets get to the recipe itself, for those who are still reading. 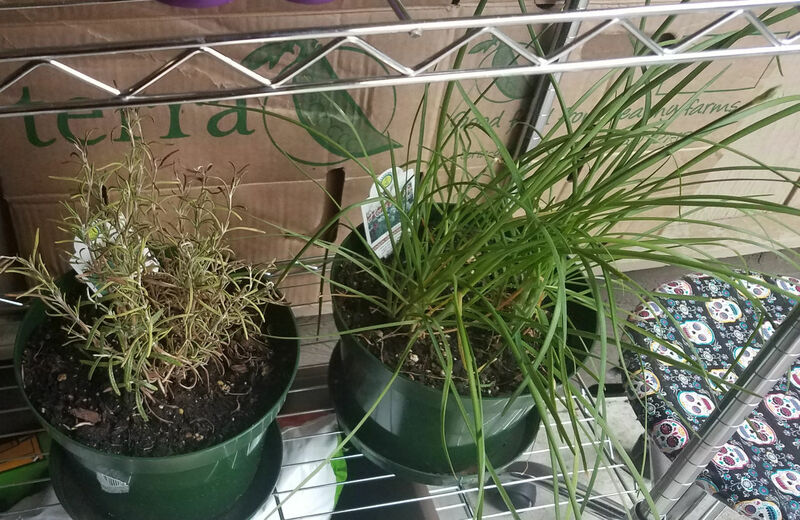 2 - 3 cups packed carrot/radish/beet tops, spinach, kale, or other greens and/or fresh herbs (arugula, dill, basil, parsley, cilantro, rosemary, chives...whatever sounds good and is on hand! ), roughly chopped. Put everything except olive oil, salt, and pepper into the food processor/blender and pulse until VERY finely minced or almost a paste-like consistency (to preference). Add about ¼ cup of the olive oil and blend, drizzling in additional oil, as needed until desired consistency. Stir in salt, pepper, and spices, if used, to taste. Refrigerate or freeze in air tight container(s) until ready to use. I usually vacuum seal things before they go into the freezer. It keeps them fresher, longer, and keeps them from getting freezer burnt. I've read a few places that pesto with cheese in it doesn't hold up well to freezing. I haven't found that to be the case. There's been no discernable difference between frozen and not frozen, so I suspect the people who wrote that didn't actually try it, or didn't package it properly before freezing. 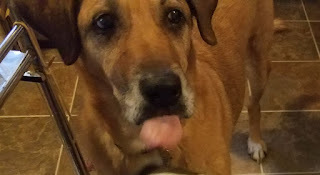 Ginger doesn't care about words, language, talking, or writing down recipes. She just wants more of that yummy stuff! Sugar appears to be in full agreement on that note.